The clothes moth larva is a small white caterpillar that lives inside a silken case or web and feeds on wool, hair, fur and feathers. Damage done will depend upon the type of item being fed upon and the species of clothes moth involved. The adult is a tiny, buff-colored “miller” that avoids light. Adults do not feed, but their presence does indicate a moth infestation. Likely spots to look for infestations around the home include boxes of old clothing, furs, feather pillows, piano felts, old over-stuffed furniture, carpets, and even lint that collects along baseboards or in corners. Mothproofing should be done as a precautionary measure when any of the above items are going into winter or long-term storage, or when these items will not be routinely cleaned. Clothes Moth (6X Actual Size). Each spring and fall, remove all garments from closets, brush them beneath the folds, and hang them outdoors in the sun for several hours. Drycleaning, or washing and pressing the garments with a hot iron will also kill moth larvae and eggs. While the closet is empty, vacuum it clean and then spray the walls and floors until moist with a household spray labeled for “crawling insect” control. Clothing stored in little-used closets can be further protected by making the doors as tight-fitting as possible and keeping PDB or naphthalene balls (mothballs), crystals or flakes in an open container on the top shelf. Follow label directions on the amount of balls, crystals or flakes for each 100 cubic feet of closet space. Never store soiled garments since perspiration and food stains favor moth development. 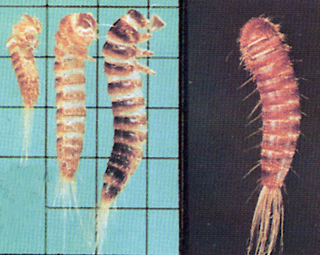 Clothes Moth Larva (12X Actual Size). Almost any kind of box or bag makes a satisfactory storage container if it is tight enough (or is taped) to keep out adult moths. Before storing clothing or blankets, first rid them of any insects by dry-cleaning, washing, pressing with an iron heated to 134oF, or brushing and sunning. Then place the garments in the storage container, and add PDB or naphthalene between sheets of white paper laid in with the articles. The label will instruct you on the amount to use. First, eliminate any moth infestations by dry-cleaning, washing or brushing and sunning both sides of the rugs and rug pads. Before replacing them, spray both floor and rug pad lightly with a “crawling insect” spray. The same treatment is also suggested before installing wall-to-wall carpeting if the carpeting is made from natural fibers. Rug and carpet surfaces, especially around the edges and under heavy furniture, should also be sprayed. Read labels carefully before applying any product on a carpet. Specifically check for comments on potential staining. The carpet beetle larva is a fuzzy, slow-moving, light brown or blackish worm about 1/4-inch long. 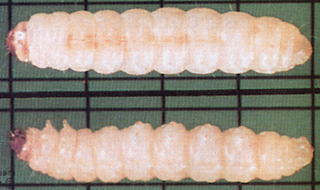 The damage it does is similar to that of the clothes moth larva, but without webbing. The carpet beetle may be found crawling over the same items that are infested by clothes moths, but is more likely to be found in lint swept from beneath the edges of rugs or similar places. Skin which the larva sheds is often found mixed with lint and dust. Preventive measures for carpet beetle are the same as for clothes moth, but special measures are needed to get rid of existing infestations. Carpet beetles usually live in lint and debris, including that which collects inside of walls, beneath floors and behind built-in storage spaces. Therefore, exposed areas should be swept frequently; and all cracks or openings where the insects might enter, such as beneath quarterrounds, should be sprayed with a “crawling insect” spray. Carpet beetles, especially the black carpet beetle, also infest food and other stored products. When this occurs, control procedures are quite different. See Publication E-37, “Insect Pests of Home Stored Foods”, for a discussion of this problem. Black carpet beetle larvae (12X actual size). The black carpet beetle is a solid black beetle about 1/4-inch long. Most pest control specialists provide dependable service for controlling clothes moths and carpet beetles. Since satisfactory prevention and control require a good understanding of these pests and how to properly use insecticides, most homeowners would be best advised to contact a professional. Fur storage vaults are available in most larger cities. 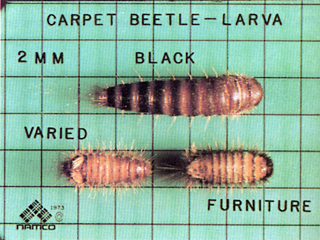 Black carpet beetle (top) compared to other carpet beetle larva. 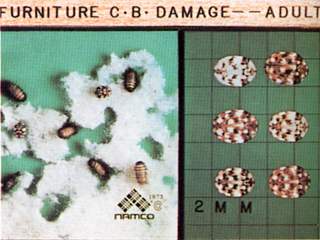 Furniture carpet beetle larva damaging felt (left) and adults (about 1/4-inch long) showing the varied color pattern of scales on the top side. Carpet beetles - Anthrenus spp. *Colored pictures contained in Purdue Extension Publication E-81 (Photos provided by NAMCO).